Long Son Big House is recognized as a national historical and cultural monument in 1991. For more than a century, every deceased resident of Long Son Island has been buried in the same coffin. 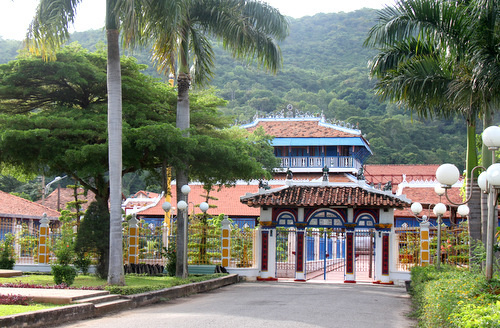 The residents of Long Son Commune near the Vung Tau port city in southern Vietnam follow the Tran religious teachings set out by the island’s founder, Le Van Muu, early in the 20th century. Muu was a resistance fighter against French colonialists in the 1800s, but the war forced him to flee his hometown in the Mekong Delta. He and a small group of people migrated to an unpopulated Ba Trao Hamlet (now Long Son Commune). Muu settled there, built permanent homes, and formed a religious practice on the basis of maintaining human virtues. His teachings focus on living harmoniously with nature and loving people. Besides that, there are not any rules and books that adherents have to strictly follow. They can get married and have children, but maintain a simple life close to nature. Adherents wear the ao ba ba, a baggy shirt that is popular among peasants in southern Vietnam, tie their hair in buns, walk bare feet, and keep their head bare, too. Togetherness is a cornerstone of Muu’s philosophy. People in the community work and eat together. There is a lot of bonding, and in an unusual departure from mainstream traditions, this is carried on at death as well. Muu believed that everyone was the same when they died, so he introduced the practice of sharing the same “Ba Quan” coffin when a person dies. “Ba Quan” is a standard coffin that is placed in the Nha Lon (Big House) on the island. Thanh Thi Thanh, a 75-year-old local resident, said that when a family member dies, relatives go to the Big House to ask to use the Ba Quan coffin. The deceased’s body is washed clean, dressed in new clothes, shrouded in cloth and mats, and placed in the coffin. At the cemetery, the body is taken out of the coffin and buried directly in the ground. “Ba Quan” is taken back to the Big House to be used by relatives of the next person to depart the world. She added that only those who are 12 years or older will be placed in the Ba Quan coffin when they die. The dead are buried within 24 hours, instead of waiting for a set day or time. Family members will complete the mourning ceremony at the graveyard and do not invite guests over or perform any other ritual. Those who visit the deceased will burn incense for the soul of the dead, and relatives will not receive any condolence money. This tradition has been kept alive by locals for long. 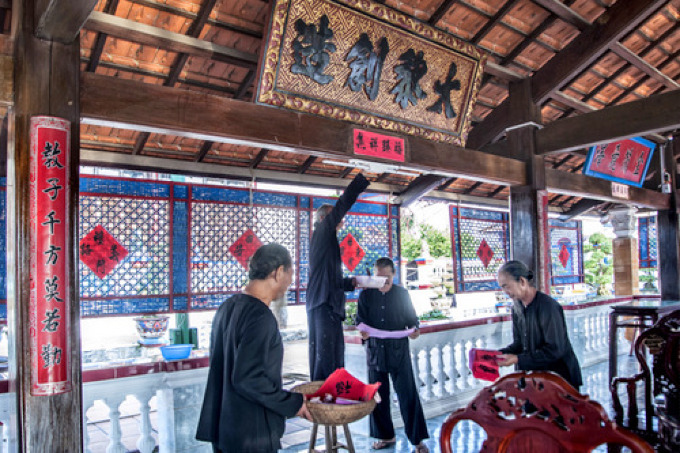 Tran Ba Viet, head of the Culture and Information Department of Vung Tau City, said that the ceremony that Long Son residents have maintained for decades has many advantages since it is very short and expenses are minimized. But since the coffin is not sealed for reuse, if the deceased had any serious, contagious illness, it could be contagious and affect the environment, Viet said. He added that he will work with locals and authorities in the health sector to identify better funeral practices to protect the environment while respecting long-standing customs.